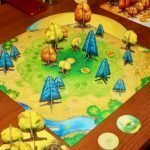 Welcome to the 6th in a series of reviews of 10 of my favorite board games. 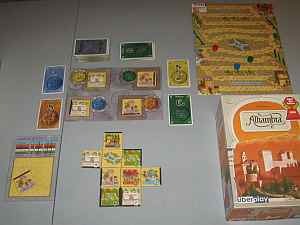 Today I examine a combination card and tile game called Alhambra. I’ve never been to the Alhambra in Spain, but I’ve seen pictures and read that it’s a beautiful place. 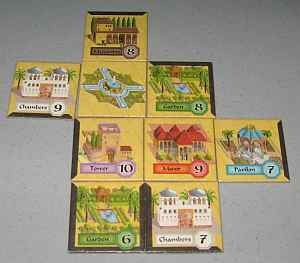 The tiles in the game of Alhambra are quite lavish as well. The cards with which you purchase the tiles are less so. 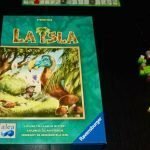 Each of the 3 to 6 players begins with a fountain tile around which you will build your personal Alhambra of tiles you acquire. Tiles come in 6 basic colors, and you want to get some of each for scoring purposes – probably specializing in a few of the colors. 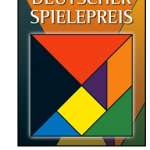 Whoever has the most tiles of a given color in each of the 3 scoring phases scores the most points for that color. And each color has different values based on how many exist in that color. Every turn, there are 4 money cards available to you. You can grab only one, unless the total is 5 or less. Money cards come in 4 different currencies. Each currency can be used to purchase one of the 4 available tiles on the corresponding currency spot. If you can pay the exact amount required, you get another action then and there. So you could have as many as 5 actions on a turn (though that is rare). 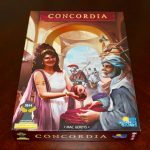 Tiles you purchase must either be added to your Alhambra following certain “wall rules” or must be relegated to your Reserve board for play on a later turn. Most tiles have 1-3 dark edges representing the walls of your building. In general, the “wall rules” state that you must arrange your tiles so that, if you were actually inside your Alhambra, you would have an uninterrupted walk (without stepping on the table) from any given tile to any other. At the end of the game, you get bonus points for your longest unbroken outer wall, so that’s something to consider while building as well. 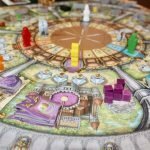 We like to play Alhambra with 3 or 4 players at most. It works with 5 or 6, but it’s much more difficult to plan your next move – the tiles you want will likely be gone by the time your turn comes again. We’ve also found that the first scoring round makes very little difference in the final outcome. On the other hand, the second phase of play (between the first and second scoring rounds) is crucial. It’s very difficult to catch the leader(s) if you’re behind after scoring round #2. The final wall bonus can make a difference too, so construct your building wisely. There’s enough strategy in Alhambra to keep college students engaged, yet it’s light enough that pretty much everyone can have fun with it. Check the price of Alhambra on Amazon.